Time has passed and this is an update and latest status on the cheating masters. Many cheating race results have been set to DSQ (disqualified) the last year and many master diplomas have from this been removed. But there is still work left. Several Worldloppet masters that we know are invalid are still presented as valid. And there are many race results presented as normal but we know they are DSQ. If you have not read the back story presented by us on Dec.29th 2016 please read it here. This cheating scandal have taken a lot of time to handle. It has become a double-case. First we have the scandal results discovered, and then we had a long struggle to get things corrected. The “Scandal reports” were made in May/June 2016. Handled by Worldloppet General Assembly in June 2016. Presented to three committees in FIS in October 2016. Someone is still working on this and we don’t know all details. FIS Legal Office is included. Worldloppet have said they will make new laws in 2017 to better handle cheating like this. FIS did in November 2016 come up with new “Universal Code of Ethics”. More is to come. Many websites wrote about this scandal case in January 2017. Some of them also mentioned the names of the three culprits and what races that contained cheating. Many Worldloppet Masters have mentioned that they feel this case has cast aspersions on all multiple masters. That is sad and we must stop it. The way to do it is to name the three notorious cheats as other websites have done. To clean the status of the other multiple masters. So we go: Cheat skier 1 is Jan Vadlejch (Israel). Skier 2 is Miroslav Dasek (Czech). Skier 3 is Roman Sevcik (Slovakia). Many race results have been set to DSQ and thus many Worldloppet Masters have been removed. The following Worldloppet Master numbers have been removed. From skier 1: master 3300, 3201, 4201. From skier 2: 3447, 3637, 3827, 3917, 4047, 4177, 4277. From skier 3: 3849, 3959, 4019. Thirteen masters removed means that all 130 containing race results have been marked invalid by Worldloppet and can’t be used in other/new Masters. During the winter of 2017 we were talking to Worldloppet-management and they promised that new Worldloppet rules would come during AGA in June 2017. New rules that would handle all this cheating masters. Enabling the removal of all Worldloppet masters and Worldloppet stamps that we know are cheating. Independently of race result adjustments and FIS actions. If Worldloppet were convinced it was cheating it would be handled. Sadly, this never came through. No change. We will for always have fake masters existing and displayed on Worldloppet webpages. In 2018 we also got a new fake master and added it to our list below. Remaining invalid masters (“Dirty Masters”) still in existence are as listed below, including detailed explanations. We will follow the development of these dirty masters as long as they exist. And update this page if status changes. Master 3601. Case Fredagsbirken 2012 CT 54km. Vadlejch and Dasek had exactly the same timing on all four intermediate timings and finish. Photo-evidence were found later. They show many pics of Vadlejch and none of Dasek. Birken knows this is cheating but refuse to DSQ the result! They will not change results as old as 2012, but Gatineau Loppet changed some of their 2010 results in 2017. We wait until Birken do the right thing. Master 3900. Case Finlandia Hiihto 2014 CT 50km. One picture of Vadlejch and no pictures of Sevcik. Dasek was with them too. All three skiers have identical timing on finish. On intermediate timing Dasek is not quite the same but Vadlejch and Sevcik has the same timing in intermediate. On search we get no picture of Dasek but on a Vadlejch picture we recognize Dasek behind him. This must mean Vadlejch was carrying Sevcik’s chip. Vadlejch and and Sevcik must be DSQ here. Master 4159. Case Konig Ludwig Lauf 2015 CT 46km. Sevcik and Dasek had exactly the same timing on both two intermediate timings and finish. There are pictures of both Sevcik and “Dasek”. But that is not Dasek wearing Dasek’s startnumber. Also, we have 50 photos of Sevcik but only 7 of unknown person with Dasek’s number. Explenation is that Sevcik was carrying Dasek’s chip and someone else was skiing only parts of track wearing Dasek’s startnumber. That is why only 7 photos, not 50. Both Sevcik and Dasek must be DSQ here. Dirty Master 4159 should be removed. Vadlejch and Dasek had exactly the same timing on both two intermediate timings and finish. No pictures but three identical timings. It looks like a clear case of cheating. Do we need pictures to get through? Master 3600 should be gone here! Master 4563. Case Fossavatnsgangen 2016 CT 50km. Sevcik and Vadlejch had exactly the same timing on all intermediate timings and finish. This was in initial result list on race day, later that day the results were removed. A case of cheating where one skier has carried the timing chip of the other skier. Sevcik has oddly been put back into resultlists. He should be disqualified (removed from resultlist like Vadlejch was) because of cheating. And master 4563 should be removed. There is also a cheating result in Dolomitenlauf 2011 FT. But the Worldlopet Master (no.3300) containing that result is already removed because of another DSQ race result. Further punishment and handling of cheating. What should be done with skiers that have notoriously cheated for seven years? Maybe much more, or certainly much more. Work group only checked some races 2010-2016. The three cheats have damaged the reputation and great status of the Worldloppet Master system. The “main product” of Worldloppet. A punishment of no more Master awards is a common reaction by Worldloppet skiers. 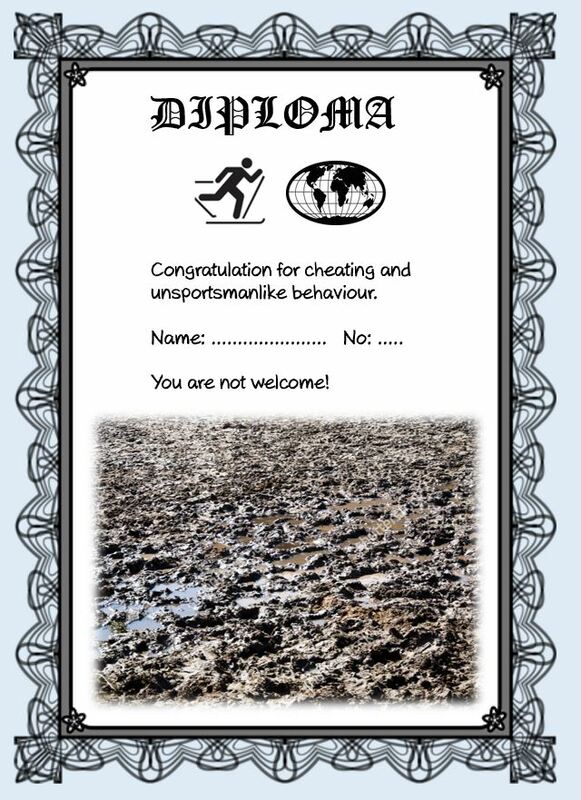 So far we have gotten words from Worldloppet that the punishment given is: the cheats cannot participate in Worldloppet Receptions for one year. And they cannot get a new Master for one year. What? This means practically nothing! Staying away from receptions is probably ok for the cheats as they want to stay low until heat is gone. No new masters for one year means they will collect Worldloppet stamps as usual and wait one year before sending in passports and request masters. No harm done to them. Let’s roll back and look at the exact words Worldloppet gave to the cheats. It was this: “First unanimously decision from the Congress was to inform you officially that YOU ARE NOT MORE WELCOME AT ANY OF THE WORLDLOPPET RACES”. What could that mean? Please stay away one year and then all is as usual? Hardly! A reasonable interpretation here is simply that these skiers will no longer get Worldloppet Masters, ever. Worldloppet cannot prevent them from starting in the races. That is decided by the race management in each race. But preventing new Masters given, their own product, is possible. What about remaining Dirty Masters? We know they are invalid and that race results are invalid. So they must some day be removed. What Worldloppet said after they had looked at the reports on the cheating case, was exactly: “The Worldloppet Congress, held last week in Finland analized the documents, connected pictures and films and decided to DELETE ALL THIS RESULTS from your passports / diplomas already emitted”. That means that all results and masters listed some day must be deleted. Today they are not all gone. We will follow this case and update this text if/when any changes come.